This week I’m working on organizing my shop more, with the focus on the entryway. 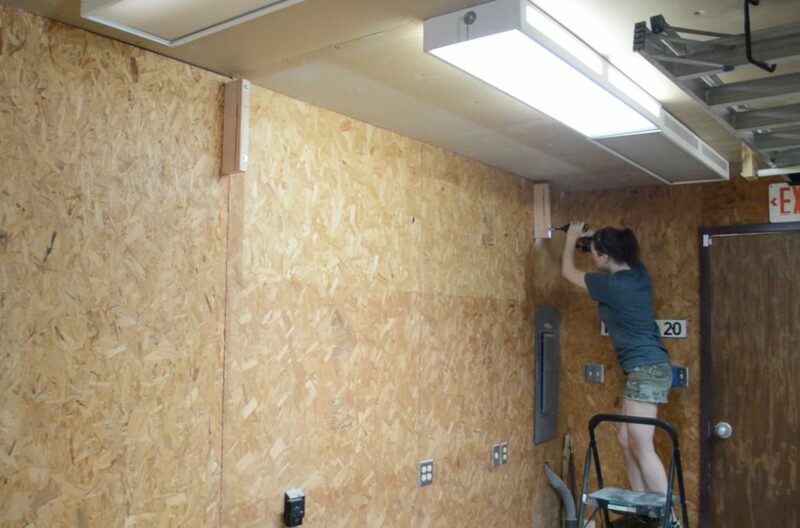 I did three simple projects that helped me better utilize this space. I tore down some cabinets and replaced it with a shelf specifically to hold my gallon paint cans. 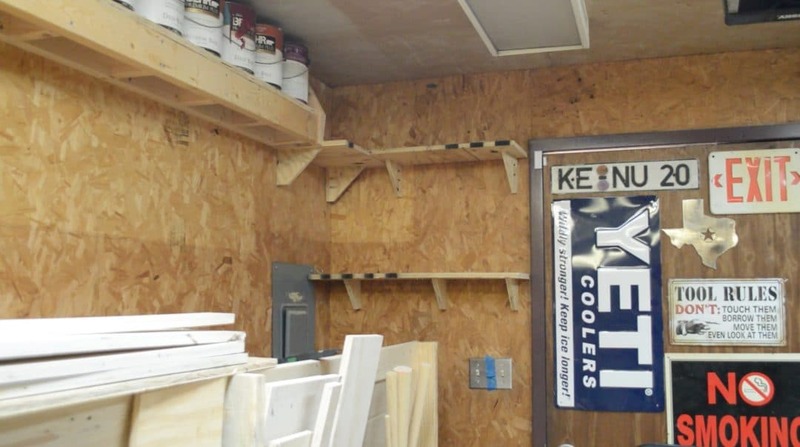 I also made some simple shelves to store just the few things that I need storing, and then I also tore down a lumber rack that I had built when I first got into woodworking and replaced it with the Triton Lumber Rack. Here is a quick before and after of my space: I guess that really doesn’t look that much different, but it really is an improvement. By getting rid of the cabinets I was able to get rid of a lot of clutter and trash that was just unseen. So the first thing I started working on was a shelf that would hold all of my gallon paint cans. 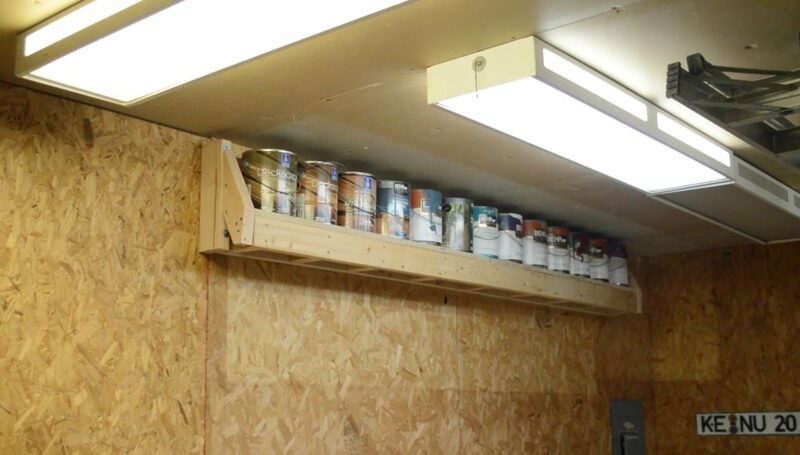 I placed the shelf very high up on the wall, because these paint cans sit on a shelf for 90% of the year so there is no point in them being within arms reach. I will need a ladder to reach these, but that’s why I always have my step stool handy. 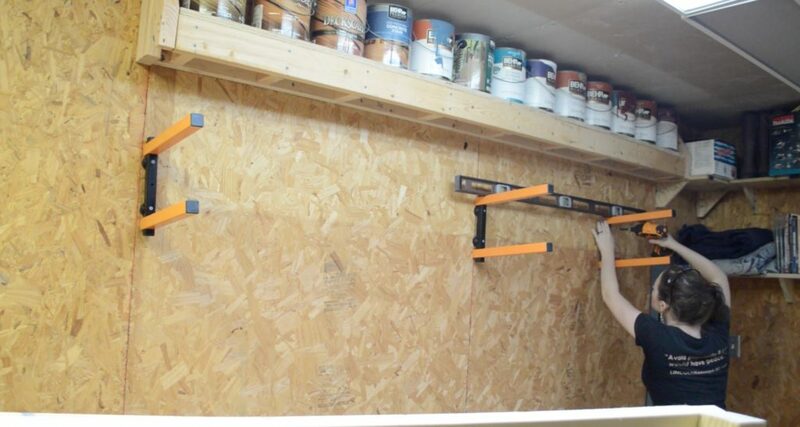 Now keep in mind, I am using this shelf for paint cans although you can extend the depth of your shelf to whatever storage needs you have. And just a tip from me, it is my personal opinion that lower wall space should be left for things that are used often and high wall space should be used for things that aren’t regularly used. These are just some very simple shop shelves to utilize this wall space. I threw these together in a matter of minutes and only used scraps. I am using 3/4″ material for these. 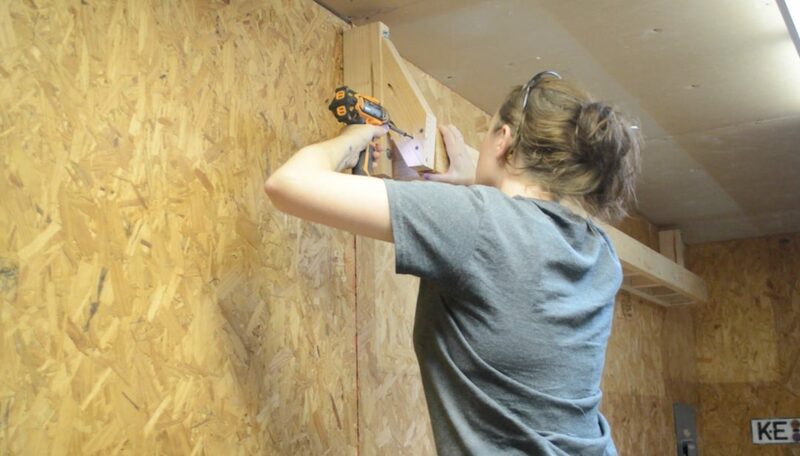 I started the build by measuring my wall space to figure out how long I needed to make each cut. Since this is a corner, I didn’t want to have any wasted space, so I cut two boards and used pocket screws to join them together. Then I cut a few triangles so make some supports. I just eyeballed these so that the triangle would be large enough to support the majority of the shelf underneath. I drilled two pocket holes on the back of the support and one on the top so that I’ll have a way to attach it to the shelf itself. To make installing these easy, you can attach the supports first to the shelf using the single pocket hole. Then once all four are attached, hold it up to the wall and use the remaining pocket holes to attach the supports to the wall. 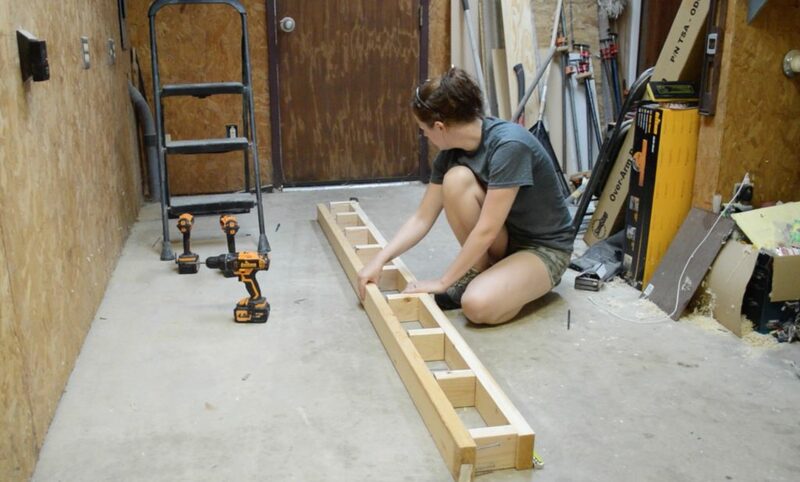 I repeated the same steps to make a second shelf, however on this one, I knew that I was going to be utilizing the wall space for long pieces of wood, so I only made this shelf for one wall. I honestly don’t have that much to store on shelves because I do a pretty good job tossing out anything that I don’t regularly use. But there are still a few things that I do want to keep around so these work out perfect. The next thing I did was install my Triton Lumber Rack. Now, I had a lumber rack that I quickly threw together when I first got started in woodworking, but this Triton one is just a much higher quality lumber rack, so I decided to use it. First thing I did was tear down my old lumber rack and then figure out where I wanted this one placed. 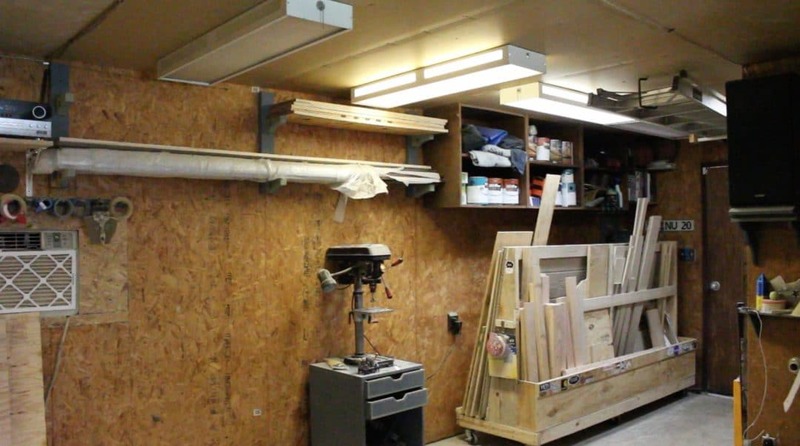 Now again, I like to use the lower half of my walls for things I constantly use or need, or future machines I am going to incorporate into my shop, so I didn’t want to attach the lumber rack as is on the wall because it would extend down too low. 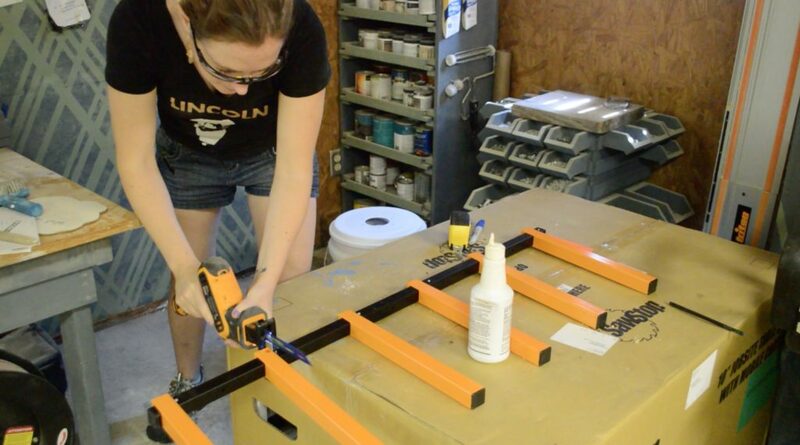 What I decided to do was to take this rack and cut it into pieces so that I could position it where I wanted. However, keep in mind that you don’t have to do this. This is a pull out of the box, ready to use lumber rack with only a little bit of assembly required. I decided to cut each section into threes. 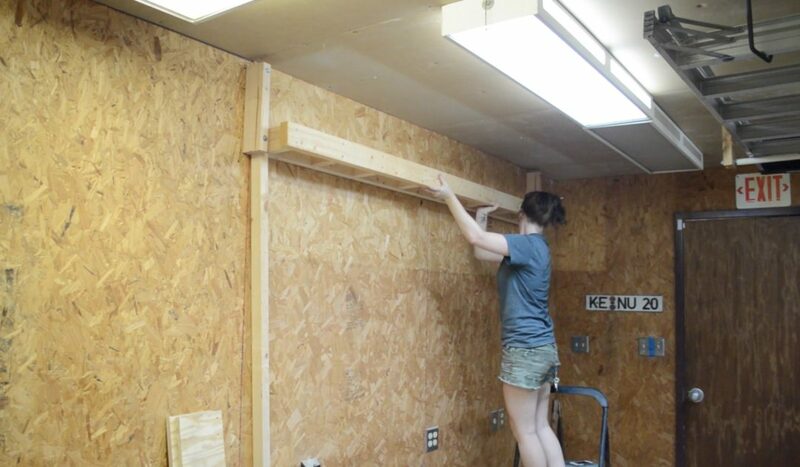 This way if I store 8′ joints I will have three supports instead of two. This will give me two separate shelves, with three supports each. To cut the metal I used the Triton reciprocating saw with a thick metal cutting blade. Be sure to use cutting fluid. After going through and making all of the cuts, I next had to make some spacers. The rack comes with six plastic spacers, which is typically enough, however since I cut mine up I need six more so I just made some from wood. To make the spacers, I grabbed some 3/4″ material and cut a dado channel that is wide enough for the black bar to fit into. Then I used my table saw to trim up the sides so it was about a 1/4″ thick on either side. Here is a photo of my spacers and also a photo of the Triton spacers. 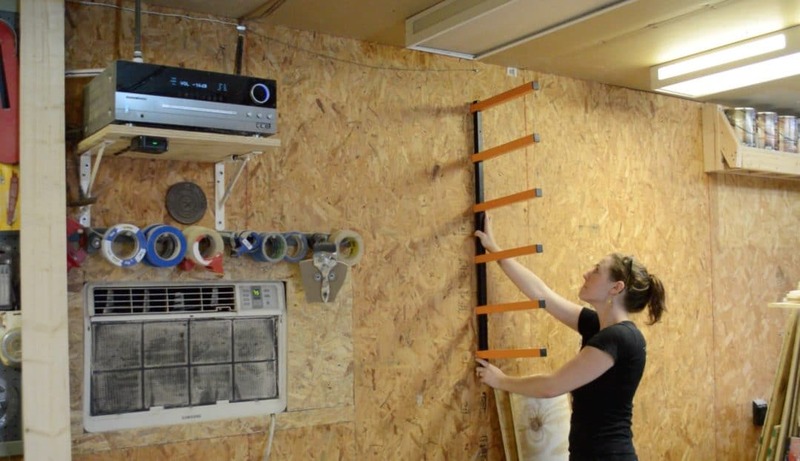 Again: If you don’t cut your rack up, you don’t have to make these. 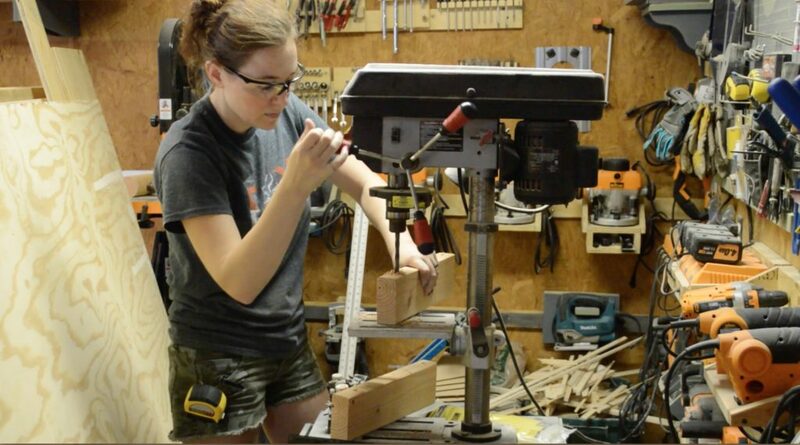 Next, I went to the drill press and used a 1/4″ bit to drill new holes in the black bar in each section. I placed one near the top and one near the bottom, inside the two arms. Make sure to use cutting fluid. I did this step just to give each section a better hold. I located the studs once again then used 3″ screws to attach each section. Make sure you put both spacers on before screwing it down. Now the majority of scraps that I have in my shop are less than 8′ long. They are normally around either 4′ or 6′ so in order to utilize this rack for the shorter scraps, the next time I have some scrap 3/4″ plywood I will cut a strip of 12″ to lay down on these to create a platform of sorts. That way I’ll be able to utilize all of the space even if I have a shorter pieces that don’t extend across the three racks. And that’s it for this week. I am a lot more satisfied with this set up now. Of course I have tons of other shop projects that I need to get to so stay tuned. If you like this project and want to stay up to date with what I’m building, then be sure to sign up for my email newsletter and you’ll get an email when I post something new. See you soon! *Disclosure: Some links in this post are affiliate links meaning, I may get a commission if you make a purchase. Thanks for your support in this way!